When it comes to good “guac” I have absolutely no will power and a good green smear on morning toast just makes my day. This tempting fruit, yes fruit, is as smooth as silk and feels incredibly, indulgent. I used to “unsuccessfully” try to avoid eating avocados because I thought they were fattening and silly me, I’ve felt guilty all this time. So, I decided that if I was going to keep up my avocado love, I was going to need to justify. A good excuse is hard to come by so I decided to do some serious homework. I devised a math problem and voila! I found my alibi. You see to me, eating avocado is like eating butter, it’s so indulgently smooth and delicious, it even spreads like butter. In fact, avocado is substituted for butter in lots of recipes. So here is the number crunching I did. A standard serving size = 1/3 of an avocado = 50g = 3 1/2 tablespoons = 80 calories= 23 calories per tablespoon. The same serving size of butter = 50g = 3 1/2 tablespoons = 350 calories = 100 calories per tablespoon. So, 23 avo versus 100 butterball, what’s the question? Instead of the typical amount of butter on toast I can have more than 1/3 of a darn avocado no problem, plus there’s no cholesterol, trans or saturated fat. I’m so in. In fact, I’m not feeling butter already! Don’t let its smooth character fool you. 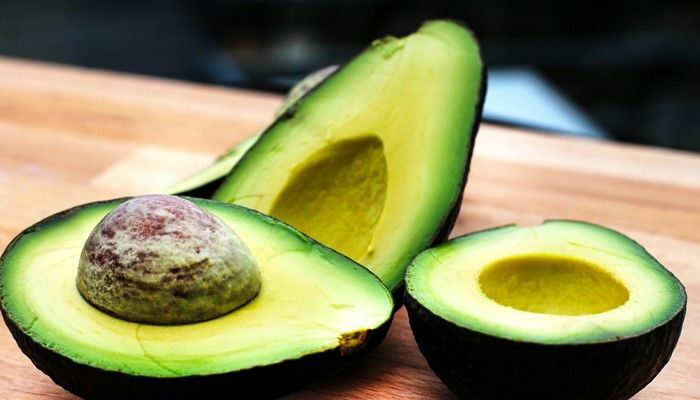 Shockingly avocado is actually loaded with fiber, plant sterols and poly and mono-unsaturated fat, all of which help decrease bad cholesterol and blood lipids. It’s so good for your heart. Plus, it’s a naturally sugar free fruit. Avocado is a very nutrient dense food and surprisingly it has more potassium than bananas; a great ingredient for those who exercise a lot or have high blood pressure. Also, if you are smart enough or old enough to be mindful of your lutein intake you will love this. Avocados are rich in important lutein. Actual avocado intake when studied against lutein supplements, is a way more effective way to get lutein to do its job. This super important ingredient helps maintain our good vision and our nerves as well as being very important for proper brain function. So, now do you see why eating more of this green goodness is such a great idea? I didn’t need a lot of convincing to get me to crave avocados, but if you need more reasons, our creative Chef Jeremy is here to give you some. Plus, our talented chef’s at Salty’s are serving up very delicious ways to enjoy avocado this summer. You should come check out Salty’s luscious “Salmon belly BLTA salad”. And by the way, if you feel even the least bit guilty, remember, you’ve got an alibi!